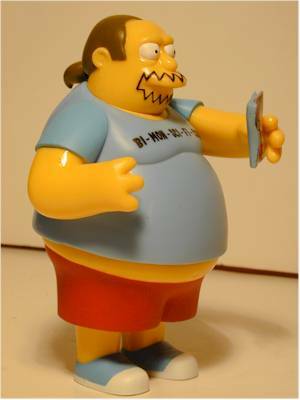 There's been lots said about Toyfare exclusives, much of it not good. 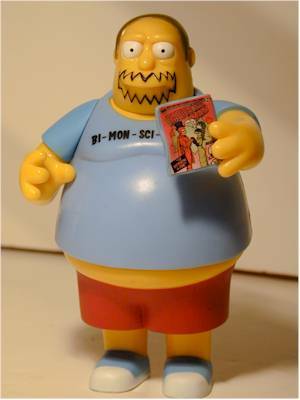 But this review is of the Convention Comic Book Guy exclusive, not of Toyfare, Wizard Entertainment Group, or anything to do with how they actually handle these figures. I've written a couple features on the subject if you want to check those out. No, now's the time to look at this figure, and judge him on his own, uh, merits. I received this in the mail this week, and your only option if you didn't order this from Toyfare is one of the many secondary market sources like ebay. The boxes that are being used for the Toyfare exclusives follow the same look as the WOS cardbacks. While I'm fairly tired of that look by this point, I must say that the boxes can withstand a lot of abuse. On top of that, they are collector friendly, and you'll be able to remove this figure and replace him in his plastic tomb if you feel like it. This particular figure can't really take too much credit for it, but this is one of my favorite sculpts in the WOS line up. 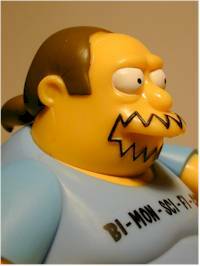 Comic Book Guy is one of the funniest characters on the show, on the rare occasions that he's on. 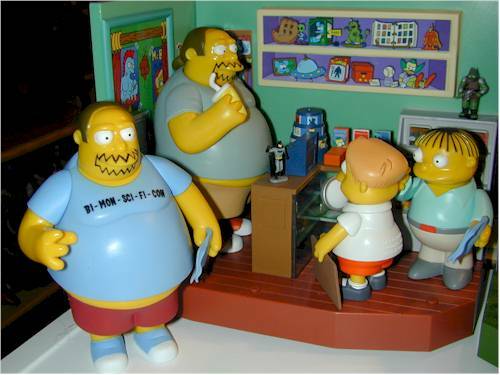 This is simply a repaint of the original figure that came packed with his shop, the Android's Dungeon. The sculpt is identical, and the only real flaw here is that because he doesn't come with the same cup for his right hand, the sculpting there seems a little weird. Nice paint ops on this figure, and I actually prefer the color scheme of his shirt and pants to the original version. The paint work on his face, beard and hair is great, and all the lines are clean and well done. The best part of the paint ops is the "Bi-Mon-Sci- Fi-Con" on his shirt. It's not all that special, but I was afraid we'd get a sticker. Fortunately, it's painted on, and well done. Did you have a nice Christmas this year? We did. Didn't really do much...no trips or anything. Oh, yea, articulation - neck, shoulders, waist. CCBG only has one, the comic showing the wedding of Radioactive Man. It should fit in his right hand, but it isn't the greatest fit. The sticker for the comic looks good, but this is the same accessory we've seen plenty of times before. I think the comic is ranking right up there with the clipboard for most over use. Toyfare was charging about $17 for these as I recall. That's about ten bucks more than he's worth. 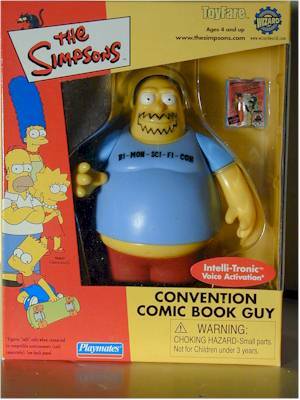 They did throw in shipping, but since that's 3rd class (and the folks that are still waiting on Boxing Homer know how bad that can be), it didn't do much for the value. Okay, I can't resist saying it..."Worst Exclusive Ever". The thing saving this from a score of less than two stars is the simple fact that it's CBG, one of my favorite characters. With nothing more than a simple paint change, he's a really weak exclusive. At this point, third party folks like Ebay are you're only option. Give it a few weeks, and I bet you'll get him fairly cheap.